“The opposite of happiness is not sadness, it’s boredom.” Such is the philosophy of Hedda Gabler, the strident anti-hero of Henrik Ibsen’s 1891 play of the same name. On the evening of Friday, April 6, the annual Senior Theater Festival (STF) started off with quite a bang with “Hedda Gabler” as its first installment. STF consists of a series of three plays, all completely student-directed, -acted and -produced, and is the culmination of a year’s worth of work by graduating theater majors. Senior theater majors spend all of fall semester reading and researching plays, deciding who they would like to work with and what role they’d like to take in the festival, which will serve as their final thesis project. Aldisert had directed a scene from Ibsen’s most famous work, “A Doll’s House,” and fell in love with the playwright’s gritty subject matter and commitment to realism. “I think that I am drawn to the fact that he is someone who is so far away from us both in time and place, yet his plays continue to be produced second-most in the world after Shakespeare and they feel very much alive,” he said. While Ibsen is considered the father of realist drama, Aldisert and his team decided to put their own spin on the show, taking a more expressionist and surrealist turn. This shift is expressed mostly through exaggerated acting and physicality. As Hedda grows increasingly trapped by the limitations of high society, characters begin to transform into the beastly creatures that keep her so imprisoned. Her bland husband’s studious posture by the second half turns into a sloping hunch. His aunt’s overbearing propriety translates to stiff robotic movements. 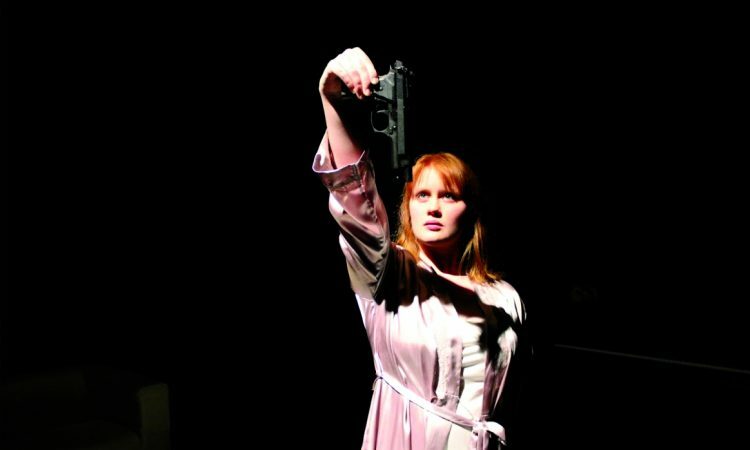 This innovative approach combated what is perhaps the most difficult part of producing a show like “Hedda Gabler”: portraying the complex psychology of an unapologetically unlikable character. One can see this desire for escape even before the surrealist turn in the show, as it’s expressed through nearly every production element. The play’s set, consisting of just a couch, a table and a piano, is painted completely in white, giving the stage a sense of eerie emptiness, no doubt meant to invoke the emptiness Hedda feels as she attempts to go about her tedious life. The show was also staged in the round, meaning that the audience is seated on stage with the actors in a circle, implicating them in Hedda’s actions. Not only was the audience more aware of each other, but the actors were also that much more aware of the audience. There were several moments when actors would turn to face members of the audience, sometimes performing to one or two specific members of the audience. One of the first instances of these audience-performer interactions was incited by Hedda herself, as she delicately picks up a flower she had just thrown onto the ground in a fit of rage, and flirtatiously hands it to a man in the audience. Just as society cannot contain her, neither can the constructs of the performance itself. It was tiny decisions like these that cracked open Hedda’s character. While she is by no means a likable or sympathetic character, she is not a monster either. Or if she is, then one cannot help but ask what made her so. And when the lights come up, there is no one left to blame but the audience themselves.